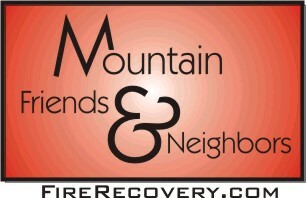 Mountain Friends & Neighbors is an organization that has mobilized out of concern and compassion for the people in our mountain communities who have lost homes or businesses. We believe the need is urgent and immediate for us to help heal the devastation caused by the recent wildfires. We have no political, religious, social or philosophical affiliation. Our mission is to come together to help those in our community whose lives have been so severely impacted by the fires. We are asking for donations of new or gently used clothing, household items, gift certificates, cash or services which will be distributed directly to the mountain survivors of the Old Fire. Any cash donations received will be used to purchase gift cards at retailers such as Target, Home Depot and Wal-Mart. An event to facilitate the distribution of your generous donations will be held the weekend of November 21 - 23 from 9am-4pm daily at the Lake Arrowhead Community Presbyterian Church in Lake Arrowhead: 351 S. State Hwy 173 (next to the fire station, across from 7-11). There will be a donation station at the church staffed from 10am-2pm on these dates: Wed. 11/12, Thurs. 11/13, Fri. 11/14, Sat 11/15 (10am-4pm this day), Mon. 11/17, Tues. 11/18, and Wed. 11/19. Our intention is to operate without incurring any expenses and give 100% of donations directly to those in need. Donations of clothing and household items will be collected at the donation station until 11/19. We greatly need donations of small household items (bedding, small appliances, cookware, utensils, etc.). Volunteers are needed to collect and sort items on November 20th and to assist recipients at the event on Friday November 21st through Sunday November 23rd.We welcome your call for information on volunteering your time, or to arrange for someone to pick up your donations if you are unable to drop them off. Thank you for your kindness, your compassion and your generosity. FIRE SURVIVORS: THIS EVENT IS FOR YOU. COME TO LAKE ARROWHEAD COMMUNITY CHURCH ACROSS FROM 7-11, 351 S. STATE HIGHWAY 173, ON FRIDAY, SATURDAY, SUNDAY NOVEMBER 21, 22 OR 23RD FROM 9AM – 4PM. Clothes, men, women and children, teens, all sizes, casual, work and business.